As the transport sector has become increasingly competitive and global, many developments have taken place in the organisation of work in ports which have affected labour and social conditions in the industry. While many ports have a strong history of tripartite social dialogue, there remains a need to strengthen the capacity and commitment social dialogue in others. 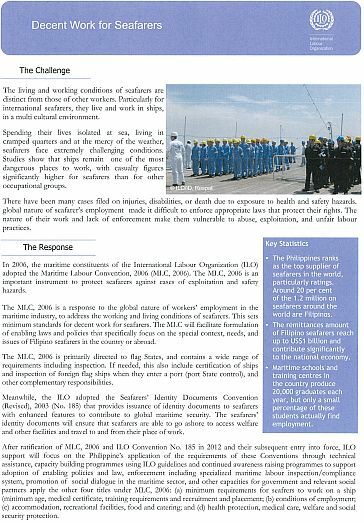 Due to its unique tripartite structure, the ILO has a major role in the collective efforts that aim at providing socially responsible solutions to the challenges faced by the port sector. Social dialogue is at the core of ILO’s port related activities, which focus on priority issues including: safety and health; security; training; working conditions; gender issues; HIV/AIDS; and the role of ports in the supply chain. Intervention by ILO Director-General, Guy Ryder on ? sustainable fisheries ?